The NonconFERMist: Turning Free Apples into Hard Apple Cider! Buy local or brew your own. Anybody can brew beer. Everybody should brew beer. Do it your way. 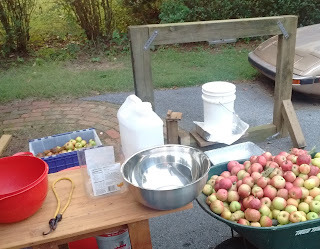 It all started when my neighbor's apple tree lost a limb and he didn't know what to do with all those apples. It didn't take long for me to say, "I'll take them!" Over the past few weeks I have scrambled to get a grinder and a press put together and press some apple juice. So far five gallons have been made. It didn't cost me much because I had most of the stuff. Only had to buy the disposal ($80 sale on Amazon) and the bottle jack ($16?). The setup works pretty well. Here are the steps for a session. You told us how to juice the apples but how do you make the Juice Into Apple Cider? Good point :-) I'll have to remedy that. Thanks for your comment. I added some basic instructions for fermenting. Does freezing beer hurt it? Find these items at your local homebrew store like Artisan Homebrew.